People who are actually prepared for a disaster are few and far in between. Most people aren’t even ready for a minor disruption, let alone a major disaster, and they tend to look down their noses at preppers like a New York stockbroker judging the cast of Swamp People. However, history has shown that luck favors the prepared, and those who don’t prepare for an emergency will be kicking themselves when the SHTF. 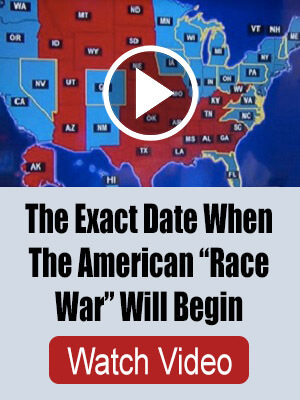 In the meantime, they’ll keep making excuses. Nobody has to achieve the setup of Doomsday Preppers to be ready for a hurricane, and conversely, two weeks of food is better than none even in the event of a global-wide catastrophe. This should be obvious, yet most people still refuse to prepare for a disaster. Here are 13 of the most common reasons they give and why they’re wrong. The biggest factor in why people refuse to prepare is the normalcy bias. This psychological phenomenon describes people’s rationalization of a dangerous situation. Basically, people assume the best will happen because they do not want to think about uglier alternatives. The normalcy bias is a form of denial that protects the mind from anything too far from an established baseline of safety. However, it is dangerous to assume that times will continue to be good simply because they always have been. Every year, countless millions have their lives turned upside down by a disaster. Denying this fact won’t do you any good. Many people explain away their refusal to prep by pointing out the long odds of a cataclysmic event occurring. They say that if such an event does happen, some power of destiny must have intervened to make it so. “If that happens, then it will just be my time to go,” they say. This is just an excuse to be lazy. If something bad does happen, chances are they’ll feel differently and won’t quietly succumb to their fate. Some people believe, or at least claim to believe, that they will somehow trigger a disastrous event by preparing. This is no more sensible than causing snow to fall by putting on a pair of skis. Really, this is just another form of denial. Deep down, they know that if they prepare for a disaster, they’ll have to admit there’s the possibility of a disaster, and that terrifies them. Some people who refuse to prepare do so with the full faith that the government will intervene and rescue them during a disaster. However, looking at the government’s track record for natural disaster response should cause these people to reconsider. Many times the government is ill-equipped to respond to major disasters, particularly in a timely manner—helping a million people at once in a hurricane is a lot slower than an ambulance responding to a 911 call. And if the disaster is large enough, people in the government will be too busy taking care of their own families. Actually, they might. It’s hard enough trying to stock up enough supplies for your own family. How is one family of preppers supposed to help the whole neighborhood? Their food would be gone in a matter of days, if that. Many people claim they don’t have enough room to build a storm shelter or enough space to grow their own food. This is simply another excuse not to prepare. Even when living in an apartment complex where such things are impossible, people can still store extra food and water. 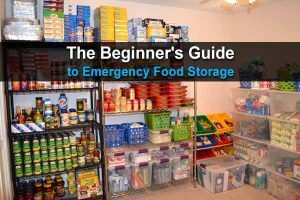 There are plenty of food storage locations if you look hard enough. Some claim they don’t have time to prepare for a disaster. They may assume prepping is an extremely involved process of making meticulous plans and working on a ton of DIY projects, but everyone has a few minutes to sit down and come up with a simple plan for what to do when the power goes out. And if you have time to go grocery shopping, you have time to grab some extra supplies. Inevitably, there will be people who raise an eyebrow at your level of your preparedness. They would not go to such lengths themselves because they don’t want to be labeled the same way they label you: crazy. But it is very unwise to value social acceptance and feedback more than survival. Besides, you don’t have to tell anyone you’re a prepper. In fact, you probably shouldn’t. Financing preparations to live underground for 20 years with fresh provisions may not be cheap, but coming up with a 6-month supply of canned goods is more doable than you might think. Those who use money as an excuse are simply living in their own form of denial. 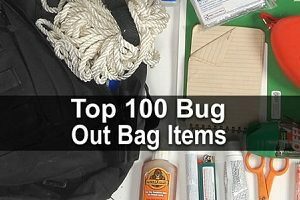 There are many ways to save money for survival supplies. Those who don’t prep may blame it on a lack of skills. “How can I be a prepper when I can’t build a hydroponic victory garden enriched by the waste of a fish pond?” they might say. Blaming unpreparedness on a lack of skills is yet another poor excuse, especially in light of how much can be learned on the Internet for free. Every skill set looks complicated at first, but once you take some time to study, you’ll realize you’re more capable of learning it than you thought. Some people who refuse to prepare for a disaster believe they are simply steering clear of all the pessimists and doomsayers. While there is nothing wrong with being optimistic and refusing to give in to fear, this attitude has no effect on what will actually happen. You can be the biggest optimist in the world, but it won’t stop an earthquake, hurricane, or some other disaster from striking your town. Many older people say they’re too old to think about prepping for a disaster. They are either selling themselves short and underestimating their own abilities or falling victim again to the normalcy bias: a major disaster hasn’t happened to them in all their years, so chances are it won’t for the last few years either. The truth is that a disaster can strike anyone at any age. And if nothing else, their supplies could help out a friend or relative after they’re gone. Some people use their faith as an excuse for not preparing. 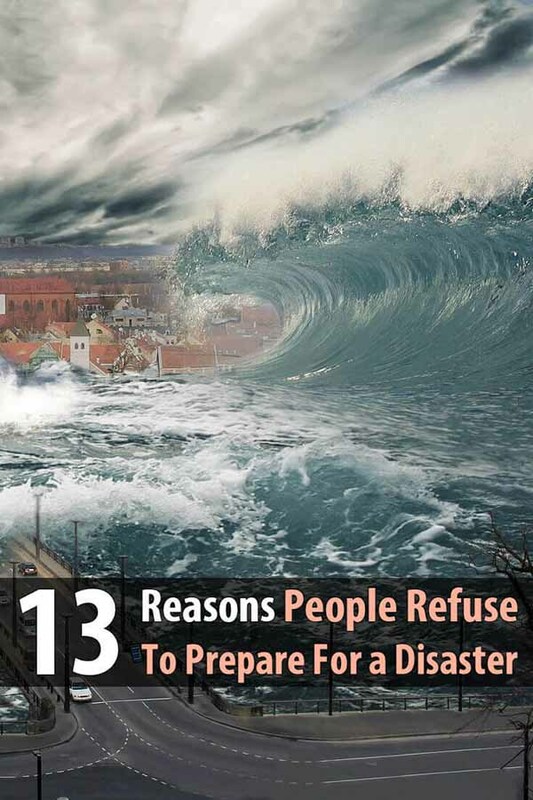 They believe that if a major disaster actually occurs, divine intervention will save them. But if you just look around, it should be obvious that it doesn’t work that way. Natural disasters strike churches every bit as often as other buildings. If you’ve ever used one of these reasons as an excuse to not prep, I hope I’ve changed your mind. Remember, prepping is like insurance. Hopefully, you’ll never need it, but if something ever happens, you’ll be glad you have it. You don’t know what you can do unless you get mentally tough with yourself and quit feeling that you’re the only one out there who has got it tough. You can stash one item (one can) for emergencies when the state pays you to shop for food each month. Frankly, your response angers me. I am a 65 year old woman living out in the country with my 93 year old mother. We are alone. Two women living on our social security checks. If we can put a can aside each time we shop so can you. No place to put anything? That’s what you said, oh, but if someone wants to give you money and food you have space for that. Time to quit being a victim and become focused and determined to do what you can, to try. No excuses. Wake up and do ANYTHING proactive toward your own survival. No one else will put up with you for long. Truth hurts. Actually some of us actually do NOT have the means to set up prep, collect foods and build anything. Some of us live in small apartments, have no vehicle nor access to one, barely scrape by on expenses day to day, and actually have legitimate reasons. Not having money is NOT just an excuse, it is an actual reason, and not the same as laziness or denial! Now if anyone would like to help, I am not too proud to accept money, foods or any other disaster prepping items free from anyone. I, however cannot afford 6 months of extra food that the odds suggest WILL spoil when after 8 years nothing happens, and need replaced again. Maybe by then I will get some extra cash, maybe not, but I do WANT to have disaster prep, stocked food and waters and items like tons of betteries, generators etc. That I simply cannot afford. It’s either get help doing so today, or when disaster strikes I will have to be one of those who steals from people I never would have done bad to under ordinary times. I would rather have what we need! And if I had money, or a yard, I would by now.